Mangalagiri Town is very famous for the Handloom weaving and Lord Narasimha Swamy Temple. The temple atop the hill is dedicated to Lord Panakala Narasimha Swamy. The fascinating feature of the temple is the 11 storeyed Gopuram, called “Gali Gopuram”. The sculptures which were carved on this Gopuram are amazing piece of work. As per Hindu Mythology, the main deity of the temple was incarnated by Eldest of Pandavas, Dharamaraj. At the foothills of the hillock there is one more shrine dedicated to Lord Narasimha Swamy. 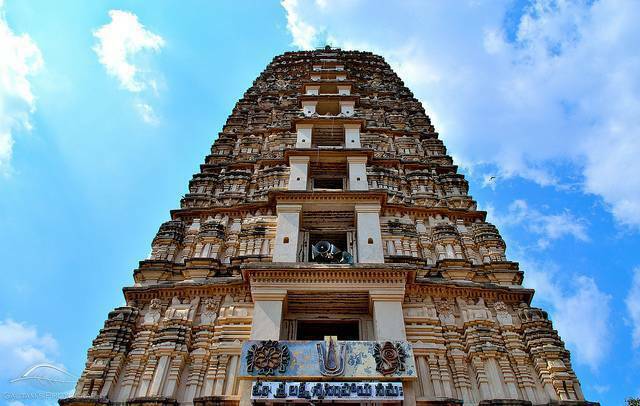 The Gali Gopuram was believed to be constructed in the 18th century by the Zamindar named “Sri Raja Vasireddy Venkatadri Naidu”. The inscriptions found in temple say that the deity here is being worshipped since “Satya Yuga”, the first among four Yugas. Devotees and Public more interest in preserving this temple as an important ancient monument. Jaggery water is the main Prasadam being offered to Lord Narasimha Swamy. Visit the temple, fetch blessings of Swamy and also don’t forget to purchase beautiful handwoven Mangalagiri cotton sarees for your family members.